When you’re going through depression, practicing activities for self-care is the last that comes to mind. But you still can, and these small activities may be just what you need in fighting depression. According to a report published last Feb 2018 in Manila Bulletin, Philippines has the highest number of depressed people in Southeast Asia, with mental illness as the third most common form of disability, following visual and hearing impairments. Data from the Global Burden of Disease Study also states that in 2015, 3.3 million Filipinos suffer from depression-related disorders. Philippines may be one of the happiest countries in the world, but these findings suggest that we’re not immune to depression and other mental health-related illnesses. If you’re living with depression, you can still practice self-care. You must first take to heart that self-care is care, intentionally provided by you,for you. It’s not a life-improving hack but a series of small choices that you’ll have to be consistent with for significant changes in your lifestyle. 1) Start small, start where you are. With depression, you are constantly exhausted that there’s just no room for drastic changes in your lifestyle. Instead, aim for small goals such as getting out of bed, taking a shower or going out for a good 10 minutes under the sun. These small, achievable goals should set the momentum and you can build from there. 2) Build momentum, build habits. Adding bigger goals as you achieve the smaller ones helps you heal. The goal is to switch from inactive to active, and in order to do that, you have to add to the small daily goals you’ve been doing great at already. Got out of bed earlier than usual? Maybe squeeze in some stretches. Took a break to enjoy some sun? Make it a healing moment with a refreshing beverage such as Lychee Treat. 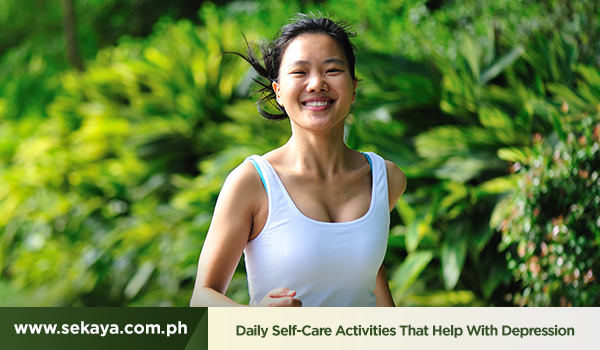 As your depression eases or lifts, you’ll be able to do more structured activities such as working on issues in your home,or getting into an exercise program. 3) Be louder than the negative talk in your head. ‘You aren’t good enough’, ‘you are unlovable’– easily, we are our own worst critics. We all have that voice in our heads that can get in ourway of having a productive, fulfilling day. But it only has power if you give it power. Foster self-love by focusing on tangible details and actual accomplishments. Give this practice a try: start a list of items that you like.It can be an event, how you handled an event or even a part of your body. Keep adding one to the list every day. The next time that voice in your head starts talking, you’ll have a list of items that will cancel out any lie about you being a failure. The empowering moment can be further enhanced by uplifting infusions such as Happy Days. 4) Heal with nature’s beauty and gifts. When depression suffocates you with a feeling of dread, focus on the magnificence of nature to awaken your senses and broaden your room to breathe. Simple changes such as inviting more natural light into your room and taking a short walk in a park reduces cognitive fatigue, lowers blood pressure, and minimizes stress. If you’re at work, a few minutes of look out of a window with a comforting cup of Floral Garden can be your way of re-energizing for the rest of the day. For total mind and body wellness, turn to nature’s healing touch in every Sekaya botanic infusion.